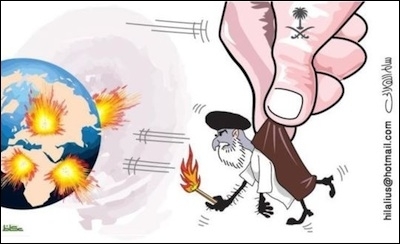 A cartoon from the Saudi daily Okaz depicts Saudi Arabia as restraining Iran from igniting fires across the region. The first, apparent for a half decade now, is the ongoing decline of confidence on the part of Saudi Arabia and to a lesser extent other Gulf countries in the power of their traditional patron – the United States of America. The new Saudi proactiveness, first apparent in the intervention by "Peninsula Shield" Gulf forces in Bahrain in 2011 to quell a nascent Shi'a rebellion there, derives from the strong sense that Washington no longer sees Riyadh's interests as in line with its own. Saudi Arabia's confidence in American protection has diminished greatly. The concluding of the deal on Iran's nuclear program on July 14 set the seal on this Saudi perception. The US, in Saudi eyes, is seeking a rapprochement with a dangerous and expansionist Iran. This desire for rapprochement is based, in Riyadh's view, on a quite mistaken US perception that Iran is available for transformation into a reasonable regional actor, in return for the satisfying of some of its ambitions. As to Iraq, Riyadh is deeply concerned at growing Iranian influence, but US backing for the Shi'a-dominated Baghdad government and low Saudi influence among the Sunni population mean that the Saudis have no strong client. Similarly, Saudi support for the military coup in Egypt in July 2013, contrary to the US position, reflected Riyadh's concerns regarding the proliferation of the Muslim Brotherhood across the region (a threat that has since declined in prominence). The Saudis must organize proactively against Tehran or watch it dominate the Middle East. So the current breakdown in relations is the latest episode in an ongoing region-wide confrontation between Iran and Saudi Arabia, which derives from Riyadh's sense that the choice facing it was to organize proactively against Tehran or watch it come to dominate the Middle East. Saudi Arabia is not alone in its perceptions. Bahrain, which is most concerned about the Iranian threat because of its majority Shi'a population, has also severed diplomatic relations with Tehran. Kuwait has withdrawn its ambassador. The United Arab Emirates, Tehran's main Gulf trading partner, has downgraded its relations, replacing its ambassador with an embassy official in charge. Qatar may well follow suit. Further afield, Sudan, too, has severed diplomatic relations in "solidarity" with Riyadh. 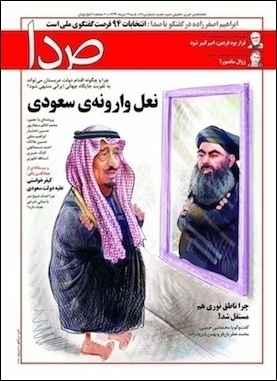 The cover of the Iranian weekly Seda depicts Islamic State leader Abu Bakr al-Baghdadi as a reflection of Saudi King Salman. Saudi King Salman is more willing to align with Sunni Islamist forces than was his predecessor. In seeking to make of itself the champion of a perceived Sunni defense against Iran-led Shi'a encroachment, Riyadh is also glancing over its shoulder at its own population and Sunni Arab populations elsewhere. It needs to demonstrate its own strength also, so as not to be credibly depicted as an unfit defender of Sunni interests by these movements or by rival Sunni states. It is notable that Saudi King Salman has proved more willing to align with Sunni Islamist forces than was his predecessor, King Abdullah, who regarded them as enemies. This fact has underlain, for example, Saudi proxies' involvement in the Jaish al-Fatah rebel coalition in Syria, alongside al-Qaida and other Salafi jihadi forces. So the Saudi decision to execute Sheikh Nimr al-Nimr, which triggered the current crisis, and the subsequent breaking of diplomatic relations with Iran are not only a simple product of Sunni-Shi'a rivalries. They are also informed by intra-Sunni concerns. But Tehran also has a built-in structural weakness. As its activities in Yemen, Iraq, Syria, Lebanon and among the Palestinians show, Iran is not able to build lasting and deep alliances with forces outside of the Shi'a and associated minorities. And the Shi'a are a minority in the region, too few in numbers to form a basis for regional hegemony. The majority Sunni Arab world remains suspicious and cautious regarding Tehran's designs on it. So welcome to the Middle East circa 2016 – state collapse, political Islam as the dominant language, an ambitious Iran at the head of a Shi'a/minorities alliance, and Saudi Arabia seeking to mobilize Sunni resistance to Iranian plans, in competition with sundry other Sunni actors. All taking place against a backdrop of American absence and Russian attempts to build a presence.